east side bride: The perfect dress for winter in London? I'm going to London for 4 months for a study abroad this winter! Obviously, I'm psyched out of my mind. But this poses a dilemma: minimal clothes, but optimum warmth. 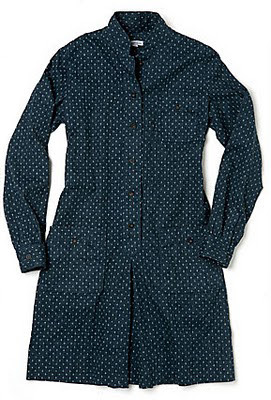 The solution, i think would be a good shirt dress or shift that can be worn with tights and sweaters and adorable coats. But I have searched high and low for a good dress that is vintagey, walkable, goes to my knees and has sleeves. If I were searching for that perfect dress to wear 5 days out of 7, I'd go Steven Alan all the way. p.s. 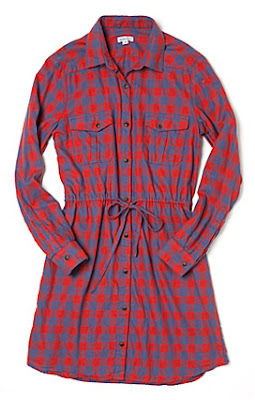 The plaid one is on sale!! If you're in London in winter, get some good boots! I favour slouchy ones, but I made sure I bought some sturdy ones that I knew would cope with tramping through puddles. Also, get some adorable gloves. something like this, son, with an oxford underneath if you're really feeling shirty. your delicates are going to need something substantial for an english winter. ...not that SPECIFICALLY, unless you're an heiress who happens to wear a size 6-8, but think wool. that damp cold goes straight through to your bones. Last Winter (in London) I lived in sweater dresses with thick tights and layers of uniqlo heat tech underneath. This Winter (in Scotland) that's already feeling a little insubstantial! great picks..i completely agree on the wool. YIKES. layer, layer, layer. I just got back from a study abroad program and I just brought completely plain basics that I could layer and 2-3 necklaces or so to mix it up. It's LONDON. You can wear whatever you like. Also, not that cold. (In London itself. Up north is a completely different story.) Last winter was a crazy fluke. Prepare for wet and grey. Lots of wet and grey. A lightbox, for example. And a cheerful umbrella. Plus wellies. Thanks for the suggestions! I've pretty much accepted that I'm going to freezing cold... I'll appreciate the tea more that way, right? I really love these Steve Alan dresses though! I'm going to lust after them continually, until i get the gumption to buy them. Which in fact, will probably happen. WELLIES! Hunters are on sale at Nordstrom right now. Under Armor and Smart Wool are great for layering under things, they've gotten me through a few winter vacations in New York. Leg warmers got me through six years in Chicago. As your eyeballs are freezing over as you wait for the train its nice to have something bright (or earthtoned, or patterned, or sparkly, or whatever) to focus on before you loose your vision entirely. The longer the better! Versatile and bike ride-able! Take minimal clothes and then shop in London? Seriously, Uniqlo's Heat Tech is your friend. Oh and layering is important because the Tube gets bloody hot in peak hour, so you want to strip off your coat/outerwear and have something relatively light underneath. It's the accessories that count too, get warm scarvs, gloves and a wooly hat. Love London! Hello, from the UK. UM. Get boots you can tuck your trousers into. Seriously. Before I had this sorted my trousers used to get wet up to the knees - like blotting paper. Not nice. Also, echoing others - wear whatever you like - it's london!!! A hat, a huge thick scarf, gloves, umbrella also help. 1. Layers, the tube get hot. I promise it's not that cold here. d'you spose Liv is wearing a dress under that coat? I would imagine nothing...she is rather saucy.